Display a 2D array as a series of colored tiles. 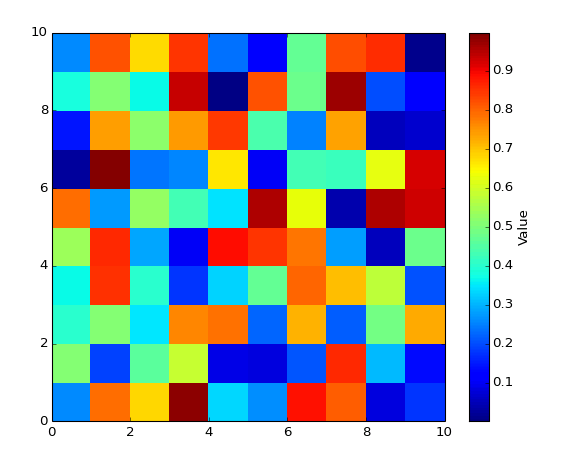 Supply a 2D array of data; it will be displayed as a series of rectangles (tiles) colored according to a colormap. The tile boundaries along X and Y may optionally be specified. This VI differs from View Array in that the tiles appear as discrete units, with no smoothing applied. It is the same approach as used with 2D Histogram Plot. By default, no lines are shown between tiles. This may be adjusted via the Line entry in the property cluster. Optional locations of the tile edge locations. Note that if Z Data has NX elements in the X direction, this array should have NX+1 elements. Defaults to 0..NX. Optional locations of the tile edge locations. Note that if Z Data has NY elements in the Y direction, this array should have NY+1 elements. Defaults to 0..NY. Controls the colormap used to color the tiles. Colormap to use. See Colormaps for more info. Lower range for colormapped data; values smaller than this will all be plotted with the first color in the colormap. Upper range for colormapped data; values larger than this will all be plotted with the last color in the colormap. Colormap scaling mode. Currently only linear scaling is supported. Flip the colormap; for example, if a map has 0.0 as black and 1.0 as white, this will assign 0.0 as white and 1.0 as black. Controls the appearance of the lines between tiles. Note: only “Automatic” and “Solid” styles are currently supported; other styles will be ignored. Controls general appearance of the tile plot. Download Tile Plot.vi, or see Examples for a complete list of examples. If Z Data is empty, no plot is made. If either X Tile Boundaries or Y Tile Boundaries has less than two entries, or contains non-finite entries (NaN or Inf), it will be ignored and the defaults (0..NX and 0..NY) will be used.